As usual please put your observations, questions and suggestions in the comments section below. Good luck! Is it a fish because of the teeth ? Has it been covered in calcium from that cave, like the dog skull you did before ? It’s not a fish (although the teeth are fishy looking) and it’s not from a cave – that’s just what’s left over from the skeletonisation process! That’s my way of ensuring at least one comment! It’s about 1cm long. Juvenile of an insectivorous species? It does eat insects and other invertebrates, but it’s not a juvenile. I can see where you’re coming from, but it’s not a mole. The teeth look quite simplistic, it may be because they’re not developed as it’s a juvenile, however I’m currently thinking a lizard perhaps..? Ooh, good call. This may be over faster than I had anticipated! First thought was you’d been at my candle wax again …. It looks as though it doesn’t have proper eyes … could it be a mole-rat? Though they have weird front teeth like spades – but it could have lost them, which would rapidly lead to death by starvation I expect. Good observation about the eyes – but it’s not a naked-mole rat, which would have the big incisors (which could indeed fall out), but they would also have a big gap (or diastema) behind them, which this doesn’t have. I meant to suggest blind skink as an alternative but forgot so Googled it. Totally gobsmacked at how many different kinds of skink there are! There are a LOT of skinks (over a thousand) – they’re the most common lizards after the snakes – if you count the snakes as lizards (I do, because they are a derived group or ‘clade’ that probably evolved from a varanid lizard ancestor). Ahem – so is it a blind skink then? Sorry! No, it’s not a skink. I would love it to be a star nosed mole but I guess from it not being a mole…. Is it blind or does it have redundant eyes, I can’t see any obvious sockets? It has eyes, but they are very small and buried under the skin, so effectively they are blind, although they can distinguish between light and dark. Given the skull size, I’d go with some kind of gecko. You’ve got it – excellent skills! Impressive first answer – I’m sure that luck played a very minor role! Looks like it could go both ways. Very astute – took me a while to work out what you meant! Is that any incredibly subtle hint at the answer? If it’s what I think, then there’s definitely a clue in there in a way. Unfortunately I haven’t got time to really go through the process here, but I think from that unique skull architecture (that makes it look like it’s been in a cave, as Jake said) we are looking at a CORRECT GROUP? No time to run through my logic, so I’ll just plump for CORRECT SPECIES, the CORRECTANSWER and leave it at that. Well, it’s certainly not a mammal, because the teeth are isodont. The small size and the absence of much in the way of eyes lead me to think it’s some kind of CORRECT GROUP, (the relative solidity of the skull also fits that, I believe) but as to the species – not a clue. I could be wrong but most/all members of the Delphinidae have isodont teeth, and they are all mammals. Not that it relates to this FMO..
Granted, I’m simplifying there, since (as you say) it’s obviously not a dolphin. I think armadillos are fairly isodont, too, but it’s not one of those, either. Some good isodont discussion here – Jamie is definitely on the right track regarding this specimen, although Zigg is also correct in more general terms. “Isodont teeth” for those of you without a scientific jargon background, are simply teeth that all look the same. 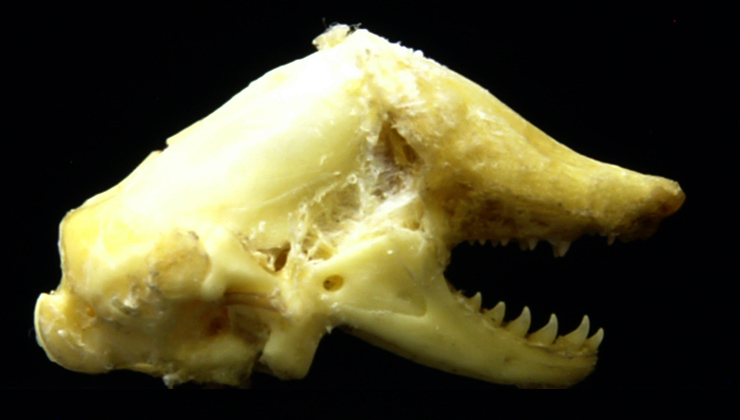 Most mammals have “heterodont teeth” which are teeth that have different forms in different parts of the jaw (the incisors, canines, premolars and molars). So, if I’m on the right track regarding it being an CORRECT GROUP… how to narrow it down? A bit of digging about indicates that the shape of the snout is fairly significant, since most tend to be rounder than that. So, I dunno… CORRECT SPECIES is the closest I can come up with. But I assume there must be plenty others that look fairly similar.